An email from "'Sue' via Change.org" hit my inbox on Saturday, asking me to sign her petition. Change.org itself is a fundamentally shady, personally invasive for-profit operation posing as a charitable petition-generating platform to "empower people everywhere." For this column, let's stick with what "Sue Whistleblower," who says she won't use her real name because she claims to be "afraid I'll lose my job for what I'm about to tell you," wrote. 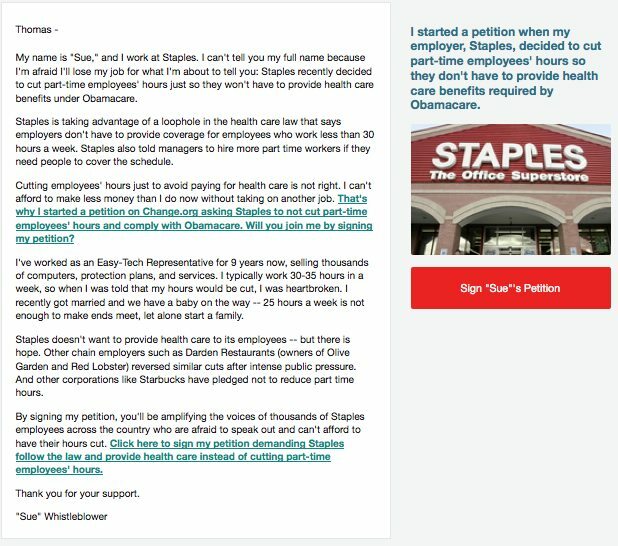 "Sue" — we'll assume that she's a real person, but one can't rule out the opposite — is "heartbroken" that big-box retailer Staples, her employer, decided in early December that effective with the week ending January 4, 2014, "part-time associates should not be scheduled to work more than 25 hours per week." Staples has also informed managers that because of this move, they "may need to hire additional associates to ensure optimal staffing levels." "Sue" asserts that the company "decided to cut part-time employees' hours just so they won't have to provide health care benefits under Obamacare." Although the company's internal instructions to store managers are silent on the topic, it's reasonable to believe that Obamacare's long-known and widely known "employer mandate" was a major factor in the policy change. Under that mandate, employers with more than 50 workers must provide health insurance to anyone who puts in an average of 30 or more hours per week — a new and unprecedented definition of "full-time employee" — or pay a fine of $2,000 per uncovered employee (after an exemption for the first 30). Thus, Staples has joined the 389 entities whose announced decisions to cut part-timers' hours compiled at Investor's Business Daily can arguably be tied to the employer mandate. The Obama administration continues to insist that there is no discernible Obamacare-driven movement towards part-timers, and that the Everest-like mountain of accumulated evidence is merely "anecdotal." That's interesting, and two-faced. Knee-jerk leftist and lead administration apologist Paul Krugman, reacting to one person's allegedly successful encounter with HealthCare.gov in October, repeated a statement he has been making for years: "[T]the plural of anecdote is data." The fact is that few firms have publicly admitted Obamacare's influence to avoid the leftist mob's intimidation campaigns. One which has taken a public stance, but is not on IBD's just-cited list, is Whole Foods. Over time, it will move 4,000 employees, or 5 percent of its workforce, from full-time to part-time specifically as a result of Obamacare. That's a lot of anecdotal "data," Paul. Overall, part-timers have increased in number by over 2.6 million during the past 73 months. Meanwhile, full-time employment, still almost 4.6 million shy of it pre-recession peak, has been stuck at barely 47 percent of the adult population for four years — down from 52 percent when the recession began.